Ships today if ordered in the next 3 hours and 37 minutes! Eshopps Nano Protein Skimmer, 10-35 gal. No room for a quality protein skimmer? Think again. The Eshopps Nano Skimmer has a small footprint of just 4 1/2" x 2 1/4" x 11 1/2" high that allows convenient placement in small spaces- perfect all-in-one nano aquarium systems. Easy-to-install in-sump skimmer is powered by the energy-efficient 6W Italian-made Sicce Micra venturi pump with needle-wheel impeller. A flurry of waste-removing bubbles is generated to help maintain cleaner, clearer saltwater aquariums. Questions on Eshopps Nano Protein Skimmer - 10-35 gal. I just got the HOB 75 and love it, I would like a HOB for my BC14. I'm confused about whether this skimmer can be used as a HOB, I get conflicting info when I research. Also it needs to be set up for the pump to be external. Thank You. Eshopps 75HOB can be used as hang on back unit. 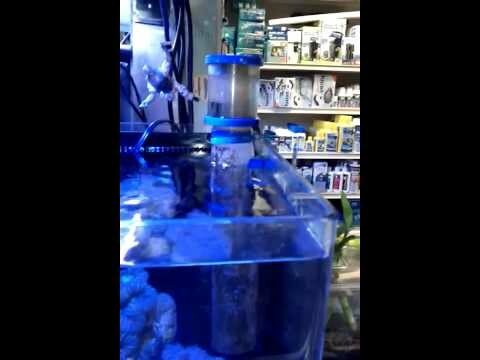 Eshopps Nano skimmer needs to be submersed and can be only be used in-sump / in-tank. You're reviewing: Eshopps Nano Protein Skimmer - 10-35 gal.